Barons first sale was held on September 28, 1998, and was opened by TV presenter and racing driver Tiff Needell, with a charity lot sold on behalf of the automotive industry’s charity, BEN. Over the past 20 years Barons has ridden out the highs and lows of the classic car market and the global financial situation, continually adapting to the changing demands as fashions and tastes come and go, but always maintaining its core standards. The company was established to offer the classic car owner and would-be owner a better, more cost-effective service, an ethos Barons adheres to this day. The Barons team were innovators – for example, Barons was the first auction house to offer online entry forms - and set up a secure, ring-fenced, client account from the outset. Barons has held more than 160 sales to date, and it all began on that day in September 1998, when the very first car Barons ever sold was a Rover. The auction house has consistently achieved strong results for British marques over the two decades, most notably for an ultra-rare, unrestored and highly original 1969 Aston Martin DB6 Mk 1 Volante Vantage, which set what remains the current record for Barons when it sold for £781,000 at Sandown Park. However, it’s not all British cars that do well at Barons sales. 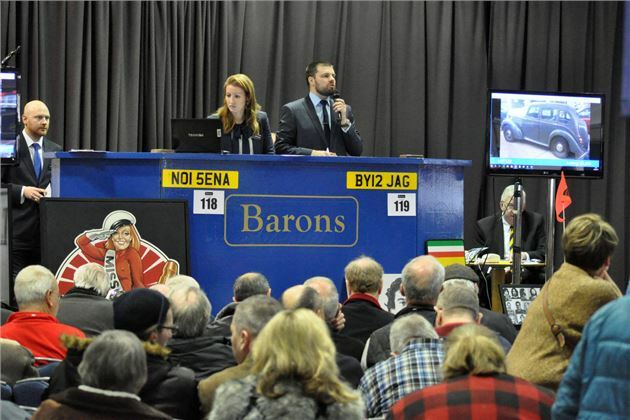 Virtually every make and nationality of car has passed through the Barons saleroom and the company has sold a number of celebrity cars including ones once owned by Britt Ekland, Peter Sellers, Frank Sinatra and Stanley Kubrick. Motorcycles, automobilia and registration numbers have also gone under the Barons hammer. How is my car valued? The team at Barons is very experienced at providing valuations, having been in the classic car industry for many years. They can usually provide an indication of value over the phone or via email, and can arrange to visit the car where required. How many sales does Barons have a year? Barons hold seven classic car sales a year, all at Sandown Park Racecourse in Esher, Surrey, where it has been based since 1998. Is there a seller's fee? Seller’s commission is 5% + VAT, which is one of the lowest in the market. Buyer’s premium is 10% + VAT, which again, is one of the lowest rates in the market. Will they prepare my car for sale? All cars entered at Barons are fully prepared to look their best in the sale room. They have a professional team of valeters that clean and polish every car once they have been positioned in the hall. How long will they store a car after the auction? Cars can be kept at Sandown Park until the day after the sale. Following this, Barons can help arrange transport with one of their logistics partners, and storage can be arranged at the Barons head office in Southampton. How long after the auction will I have to wait for payment? Barons pay vendors on the 6th working day after the sale. This is one of the fastest in the market. How much does Barons charge to include a car in its catalogue and is there a fee if it’s withdrawn prior to auction? A standard entry is £100 + VAT and a premier entry is £150 + VAT. If a lot is withdrawn through no fault of the vendor (mechanical issues etc), we will always work with them to sort out any issue, and will often offer entry into a sale at a later date. However, if a vendor chooses to withdraw a car after it has been consigned, we do charge a percentage of any lost commission. When is there the opportunity to examine the consignments before auction? Viewing is from 3pm to 7pm the day before the sale, and from 9am until the start of the sale at 1pm on the day. Will the auction house transport the car to the buyer after purchase? Barons can help arrange this with one of their logistics partners if required. How quickly are the results published after an auction? Usually on the 2nd working day following the sale. Does you offer financing to purchasers? Can insurance on a purchased car be arranged on the day of the auction?